The numbers speak for themselves: kids spend less than 7 minutes per day outside while they spend more than 7 hours on media. Our kids are becoming increasingly sedentary and spend the majority of their days indoors. And the fact that these statistics are older makes this even more of a concern. I’ll update this post with more current stats as I find them. 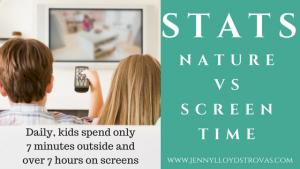 Considering all the health benefits that nature has to offer, and the lack of health benefits offered by media usage, it’s essential that we work on changing out family’s culture and change how our kids spend the majority of their time! Check out the stats below to see how screen time for kids has changed over the decades. Note: 1981 & 2002 data come from: Changing Times of American Youth: 1981-2003 for ages 6-17 years old. The 2004 data comes from *Generation M: Media in the Lives of 8-18 year-olds (2010). Averages were for 8-18 year-olds. The American Academy of Pediatrics recommends no TV under the age of 2 and only 1-2 hours of TV per day for children over 2 years. Kids who report being relatively unhappy spent 1:30 more on media than those who reported being happy. Half of American kids (8 years and younger) watch TV the hour before bedtime. Science says that setting rules can decrease kids’ media time by more than 2 hours per day! Teach mobile etiquette. For example, kids can’t be on their devices when they are at a dinner party, they need to look up and address people when they are spoken to, etc. Incorporate technology in outdoor activities. Technology is an essential part of our world and our kids need to know how to use it responsibly. You can do that by allowing them to use apps when they’re outdoors (for a limited amount of time, of course.) In fact, you can use the app to lure them into nature. Eventually, they’ll leave it behind and explore the natural world. Apps like iNaturalist, or anything that has to do with GPS and navigation are always a hit! Ref#1: Rideout, V., et al. (2010). Generation M: Media in the Lives of 8-18 year-olds. The Henry J Kaiser Family Foundation. Ref#2: Juster, F.T. et al. (2004). Changing Times of American Youth: 1981-2003. Institute for Social Research, University of Michigan. Ref#3: Gutnick, A.L., Robb, M., Takeuchi, L., Kotler, J. (2010). Always Connected: The New Digital Media Habits of Young Children. The Joan Ganz Cooney Center at Sesame Workshop. Ref#4: The Common Sense Consensus: Media use by kids age 0 to 8. Common Sense Media. Ref#5: Hofferth,S, & Sandberg, J. (1999). Changes in American Children’s Time, 1981-1997. University of Michigan Institute for Research.